Everything in Morris Lessmore's life, including his own story, is scattered to the winds. But the power of story will save the day. Stunningly brought to life by William Joyce, one of the preeminent creators in children's literature, The Fantastic Flying Books of Mr Morris Lessmoreis a modern masterpiece, showing that in today's world of traditional books, eBooks, and apps, it's the story that we truly celebrate ~ and this story, no matter howyou tell it, begs to be read again and again. This is a story about books and hopes and about what you see if you take the time to look up. 1. At the beginning of the story, we learn that Morris Lessmore loved words. He loved stories and he loved books. What do you love? 2. After the storm, Morris feels lost and wanders around. Then he looks up and sees the flying lady with her squadron of flying books. Talk about how you see the world when you look down. How do you see the world when you look up? 3. The flying lady sees that Morris is sad and needs a new story so she gives him her favorite book. How can a story help someone feel better? Have you ever felt bad and then heard a story that made you feel better? What kinds of stories and books make you feel better? 4. Do you have any stories or special words that you tell yourself to help you feel better? 5. Every story has its upsets. Have you ever had an upset? Did anyone help you? What did you do to turn the upset around? 6. When Morris entered the building with all the books, he could hear faint chatter and it felt as if the books were asking to be opened and read. It has been said that every book needs a reader to bring it to life. What do you think? 7. Morris had lots of books: comedies, tragedies, encyclopedias. Can you think of other kinds of books he might have had in his library? What kinds of books would you want in your library? 8. What do you think it means to be lost in a book? Have you ever been lost in a book? 9. Why do you think Morris enjoyed sharing his books? Do you ever recommend or suggest books to friends? Talk about your favorite books and why you like them. 10. Things end and things begin again. How does it feel to know that when Morris decided it was time for him to leave, he ended the journey as he began it – being carried lightly away by the books and with a book opening? How does it feel to know that the little girl then began the journey? 11. When you leave, what matters most is what you’ve taken in – the memories, stories, and experiences. What would you like to be inside you? 12. 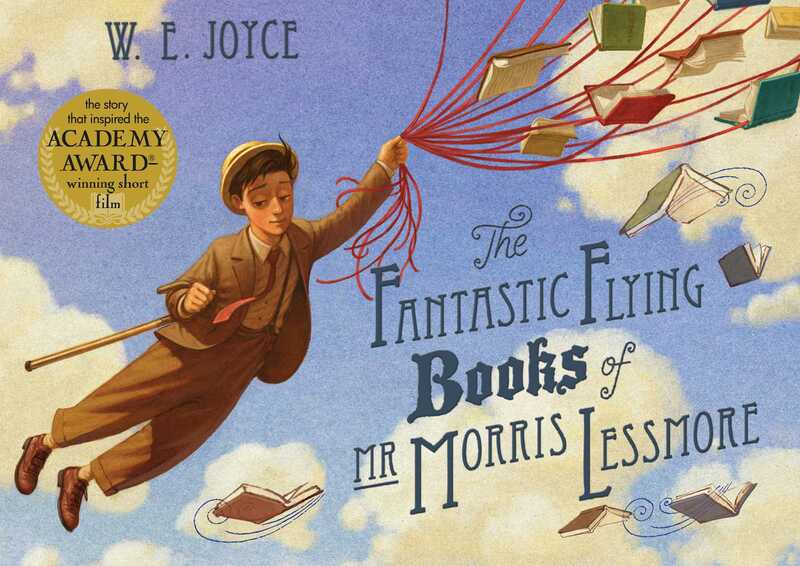 At the end of the book Morris flies off with his favorite books. How can books make you fly? 13. Morris’s life was a book of his own writing. He wrote about his joys and sorrows, all that he knew and everything that he hoped for. What are your hopes? 14. Lessmore is an interesting name. Do you think it has any special meaning? When is less more? 15. This book has a special dedication page. Does reading it give you any new understanding of the story? 16. “If stories come to you, care for them. And learn to give them away where they are needed. Sometimes a person needs a story more than food to stay alive.” (Barry Lopez, Crow and Weasel) Do you think Morris Lessmore would agree? What do you think? 1. The pictures in this book are very beautiful, whimsical and expressive. Try reading the book again just looking at the pictures. Do you notice anything new in pictures or the story that you didn’t see before? How do the pictures help to tell the story? 2. Libraries are a place where people share books. Visit a library. Notice all the different books. Do any of them call out to you to be read? Ask the librarian to recommend some of her favorite books. 3. Start your own library at home and/or in your class. Morris tried to arrange his library, but the books had their own ideas. How would you organize your library? What books would you put next to each other? Make special book plates with your name or the name of your class. 4. Make your own book. You can fold several sheets of paper and staple them together. Put a photo of yourself on the first page. Tell all about you. For different kinds of books and different ways to make them, check out the internet with a parent or teacher. A good place to start is http://tlc.howstuffworks.com/family/book-crafts.htm You can also learn how to make book plates and book jackets. 5. Morris loved words. What are some of your favorite words? Are there any words that make you feel bad? Make a list of words about when you feel happy, sad, brave, or silly. 6. Ask a parent or teacher to help you cut up magazines, newspapers or cereal boxes and create a collage of some of your favorite words. 7. Do a book advertisement. Draw or record or write about a book you like in a way that makes it sound interesting to other people. Create a web page or blog with your favorite titles. 8. Keep a dream book. Write about your hopes and dreams. Decorate the cover and include drawings and photos. 9. Have a party. Make special invitations asking everyone to come dressed as a favorite book character. Play charades or guessing games about the books the characters come from. 10. This book is also an Academy® Award-winning animated short. With a parent or teacher’s help, watch the movie on You.Tube at http://www.youtube.com/watch?v=Adzywe9xeIU Talk about the differences and similarities between the movie version and the book.